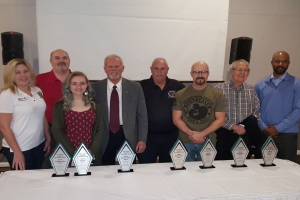 8 Vermilion County Everyday Heroes were recognized this morning at a breakfast in their honor at Turtle Run Banquet Center in Danville. All of them were nominated by their peers for their service and leadership to our community. Public Safety Hero – Larry Thomason for his commitment to keeping our community safe nearly 50 years as a police office, the chief of police, and mostly recently public Safety Director for the City of Danville. Youth Hero – Ciera Beith is a Freshman at Danville High School. She focuses her own life on helping other youth who are dealing with parental or other family member addicition. As a child who has experienced this in her own life, she works with others counseling and trying to break the cycle of generational addiction. She serves on the Soul Garden Recovery Bard as a youth representative. Education Hero – Keith Peoples, Schlarman Girls Basketball Coach for the lessons that he teaches to his players on and off the basketball court. His lessons are easily incorporated from the basketball court, to the classroom, to a pathway to a successful life. He has made a tremendous impact on not only the students of Schlarman Academy but to hundreds of basketball players, students, parents and others within our community. Military Hero – Dave Hughes is a veteran of the United States Coast Guard and started the project Mission K9 Warrior Project, which provides service dogs for veterans with post traumatic stress disorder. At last count, Dave and his team has matched 6 veteran with service dogs. Community Hero – Jenny Merrell works year round fundraising to support Working Out PTSD – a program that provides free of charge gym memberships to our Local Veterans. Jenny started this program after the tragic death of her son, Marine Sargent Aaron Merrell, who died at the age of 26 from the effects of PTSD after serving two tours in Afghanistan. Workplace Hero – Michael Rohall thru his work as Executive Director at Love Inc has found a way to connect those in need with organizations and churches that can help give a step up in changing lives for the better. There are so many needs in Vermilion County that one church, person, or organization can’t do it all, but when everyone works together, things happen. Healthcare Hero – William Butch Fields has been serving our community in the emergency medical field for 40 years. While serving as the E-M-S coordinater for the Tilton Ambulance Service he assisted with the paramedic flight car project. In his spare time, Butch is a co-founder and assists with organizing the Tilton Red Neck Games. Senior Hero – After his retirement Fowler Connell at the young age of 94 almost 95 is still very active in our community. He serves with the Key Club at Northridge Middle School and the Golden K Club. He is a volunteer at Danville High School and has logged over 4000 volunteer hours at the Danville VA. Fowler also calls BINGO at a local nursing home, assists with the NJCAA Basketball Tournament, and still covers the Danville Vikings as a valued member of the sports team at WDAN – Neuhoff Media. This event was sponsored by First Savings Bank in Danville in partnership with Neuhoff Media, Wilson’s Body Shop, Danville Area Community College, Devens and McFetride, LTD Attorneys at Law, Watchfire Signs, Jocko’s, Lee’s Famous Recipe Chicken and Strips, Anker Florist, The Villas of Holly Brook, Kruger Coan Pape Funeral Home, Kruger’s ATA Martial Arts, Hall of Fame Plaques and Signs, and Turtle Run.